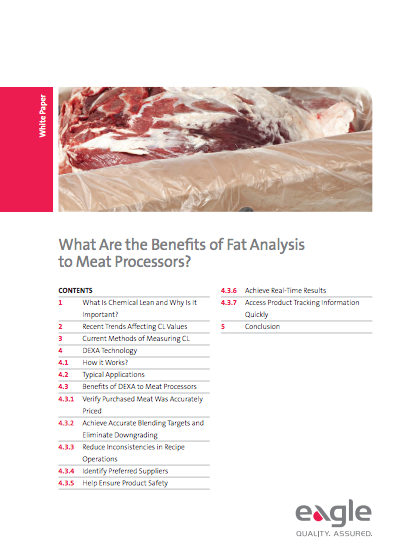 Fat analysis is a key piece of information for meat processors to know accurately. Growing pressure from the industry to report these numbers make it exceptionally important. This ebook outlines the perks of knowing your chemical lean number and how new technology, such as the DEXA x-ray, will help your efforts along. DEXA is quickly sweeping the meat processing industry and becoming the standard for proper fat analysis. Don’t be left behind. Download this free ebook to keep up with the current trends in the meat processing industry.